We don't need to leave in order for Iraq to disentegrate and break-up. It is happening now. This news is long-awaited, but now there is officially a new crisis for the fragile Iraqi government. The main Sunni Arab political bloc quit the Iraqi government on Wednesday in a blow to Prime Minister Nuri al-Maliki's shaky coalition as suicide bombers killed more than 70 people in three attacks across Baghdad. The resignation move pushed the government into a new crisis undermining its efforts to reconcile Iraqis and end sectarian strife. Fifty of Wednesday's dead were killed when a suicide bomber in a fuel truck packed with explosives targeted motorists at a petrol station. The Sunni Accordance Front left Maliki's Shi'ite-led coalition over his failure to meet a list of about a dozen demands, including a greater say in security matters. "The government was still ... closing the door on reforms which are needed to save Iraq," Accordance Front spokesman Rafei Issawi told a news conference, adding the government should have met its demands or "at least admit its failure." Issawi said Deputy Prime Minister Salam al-Zobaie and five ministers would resign on Wednesday. The Sunni Front's 44 members will remain in the 275-seat parliament. Its withdrawal will have little practical effect on the 15-month-old government, which is virtually paralyzed by infighting but needs only a simple majority to keep functioning. Maliki's government has already been weakened by the withdrawal of fiery Shi'ite cleric Moqtada al-Sadr's political bloc, one of the biggest in parliament, over his refusal to set a timetable for the withdrawal of U.S. troops. The coalition is under pressure from the United States to end sectarian strife between Shi'ites and Sunni Arabs, which has killed tens of thousands. Washington is unhappy at the slow political progress in reconciling the warring sects. 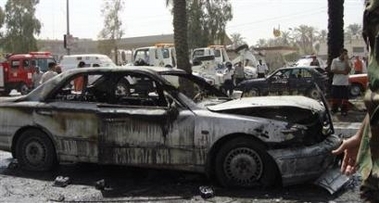 Iraq Vice President Tareq al-Hashemi, a member of the Sunni bloc, said the Front was still open to negotiation. "The doors are still open on all options, including returning to government, if they introduce reforms," Hashemi told reporters. The Accordance Front is made up of three main Sunni Arab groups, including Hashemi's Islamic Party. Its list of demands included the disbanding of Shi'ite militias that have targeted Sunni Arabs. Iraq's other deputy prime minister, Kurd Barham Salih, told Reuters the Sunni bloc's withdrawal was the most serious political crisis yet faced by Maliki's government. He said preparations were continuing for a summit of the political leadership of Iraq's Kurdish, Shi'ite and Sunni Arab communities, which would take place in "the next few days." "The crisis is grave and its implications should not be underestimated, but I hope it offers an opportunity to address the causes of political instability afflicting this country," Salih said of the meeting. The Accordance Front, which last week suspended the work of its six ministers and gave Maliki a week to meet its demands, accused the government of failing to consult it on key issues. The U.S. ambassador and the top general in Iraq are due to give a crucial progress report to Congress next month as U.S. President George W. Bush comes under growing pressure to show progress in the unpopular war or bring troops home. In Baghdad's Mansour district, police said the suicide bomber had lured motorists queuing for petrol before exploding the fuel truck. Another 60 people were hurt. Twenty people were killed when a suicide bomber blew up his vehicle near a popular ice cream parlor in a bustling commercial area of Baghdad's predominantly Shi'ite district of Karrada. Another bomber killed three in southern Doura district. 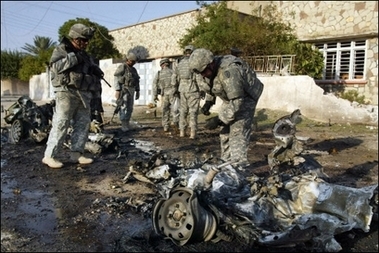 The U.S. military, which began a build-up of 30,000 extra troops this year in a bid to buy time for Maliki to meet his political targets, said three of its soldiers were killed by a roadside bomb in the east of the capital on Tuesday. Another was killed by small arms fire in eastern Baghdad on the same day, taking the total killed in July to at least 78, the lowest monthly toll for the U.S. military in Iraq since last November and since the troop build-up began in February.